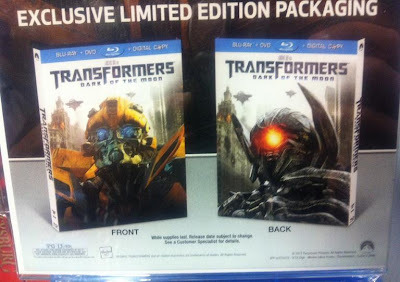 The HD Room was able to score an early copy of the upcoming release of Transformers: Dark of the Moon and learned just a touch more about the "deluxe" edition that is planned for release later this year. They confirmed the DVD and Blu-ray release is just the movie without any bonus features. It also comes with a $10 off coupon for the "Ultimate Edition with Blu-ray 3D" for DOTM that will come with Blu-ray, Blu-ray 3D, DVD, and Digital copy. Again no information on extra features or when the ultimate edition will come out. 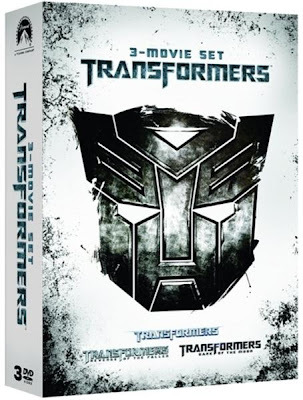 This re-enforces that there is absolutely no reason to buy the movie when it is released on September 30th until Paramount releases the details on these later editions. In a related note, Play.com has revealed the cover to the Transformers Trilogy set for DVD and Blu-ray that is currently set for release on November 28th in the UK. No details on extra features so no idea what version of the movies (with or without extra features) it will contain. The games that Paramount is playing the details on these various editions are starting to get really old. People shouldn't have to guess the specifics what they are buying, especially when it comes to movies. As a result, this too falls under "Do Not Buy" until the details are made available. The latest ad to promote the release is below. It's not double dipping if they tell you there is going to be more than one version, and they also tell you that the second version is going to have extra features. Double dipping is if the studio releases one DVD, and than like a month later they surprise you with another release and say, "Oh, by the way this one has more than the first!" That's double dipping because you weren't advised in advance that there is more to come. You thought you got the best copy and now you're told there is a better one on the way AFTER your purchase. Bonus features are useless to me, with rare exceptions. And I couldn't care less about 3D. 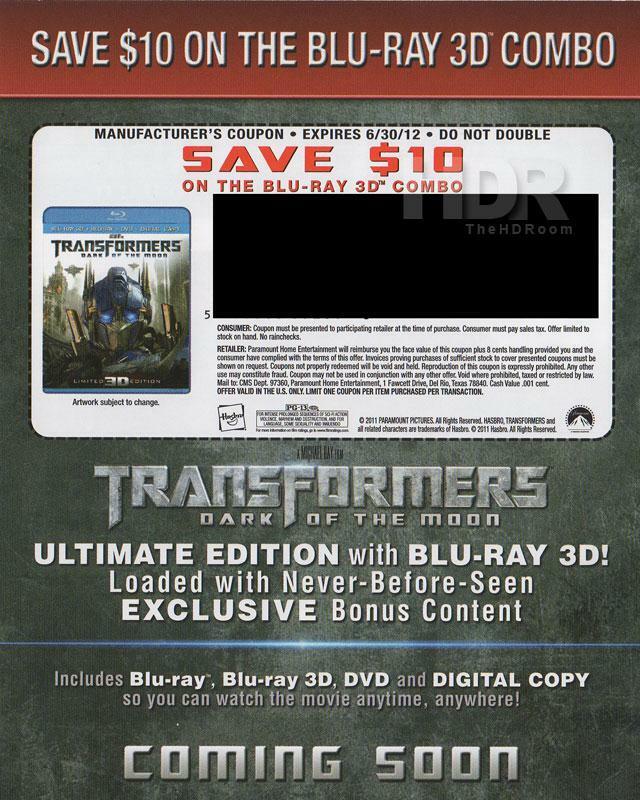 So yeah I'm getting the "movie only" blu ray. "This re-enforces that there is absolutely no reason to buy the movie when it is released on September 30th until Paramount releases the details on these later editions." 1.) To get to watch the movie as much as you want until the Ultimate Edition comes out. Am I the only intelligent human being that has considered just selling the Sept. 30th release when the Ultimate release comes out? Even if you sold it for $10 less than you bought it, with the $10 coupon you gained, you basically will get your money back. You lose nothing and you have had the movie in your possession to watch for a good 2-3 months. Makes no sense to tell people not to buy something for no intelligible reason. someone please tell me which one has "Special Features" lik behinde the scence thats all i want please my birthday is coming up! I NEED TO KNOW! So these copies on friday are JUST the film? i am a silly collector who lives for Transformers. I own the regular TF 1 and the special edition along with regular TF 2 and special edition of that also. 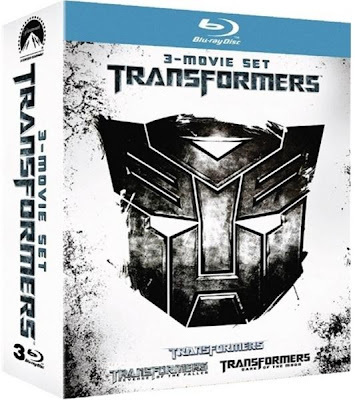 I already bought the Blu-ray, dvd, digital copy pack, the WalMart exclusive Blu-ray with the Sentinel cover and bonus footage, and the regular dvd of DOTM also today. i am most definitely also going to buy all the latter versions of DOTM along with the triple pack most likely. I want them all.